Today I was transcribing a 1830 deed for Jonathon A. Proctor where it states “Agreeable to the 21st section of an act of the assembly passed at Knoxville in 1806 commonly called the land Law”…. SEC. 21. Be it enacted, That it shall and may be lawful for any person or persons who may be desirous of establishing the bounds of any lands he, she, or they may claim by virtue of any title derived under a grant from North-Carolina, or which may hereafter be derived from this state, which said title is good and valid in law, to cause the same to be processioned, in the following manner, viz: Such person or persons shall cause notice to be given at several of the most public places within the country, wherein said lines are to be processioned, at least twenty days before the same is to be performed, of the time appointed for processioning, and the corner at which he intends to begin; and he shall also notify the holders or their agents in writing, of such intention as aforesaid, if such holders or their agents reside within said county; and it shall be the duty of any surveyor appointed under the authority of this act, upon application to him made, to run, mark, and describe such tract of land agreeably to the former lines, or natural boundaries, (if any) described in such grant or deed, founded upon a grant; or if such lines have not been marked, to mark new lines agreeably to the calls of said grant or deed: (Provided, such deed or grant may have been recorded in the county where such land lies) and make a correct plat and certificate of the same, as required in other cases, and return the same to the register of said county, to be recorded at the expense of such applicant; and in any case where the lines are contested by adverse claimants, the sheriff of said county shall, upon application of either of the parties, forthwith summon a jury to try the matter in dispute, whose decision shall be a guide to the surveyor in making his return as aforesaid; and the surveyor shall be entitled to the same fees, and be subject to the same penalties as prescribed in other cases; which fees shall be paid by the person or persons at whose instance such processioning shall be made. 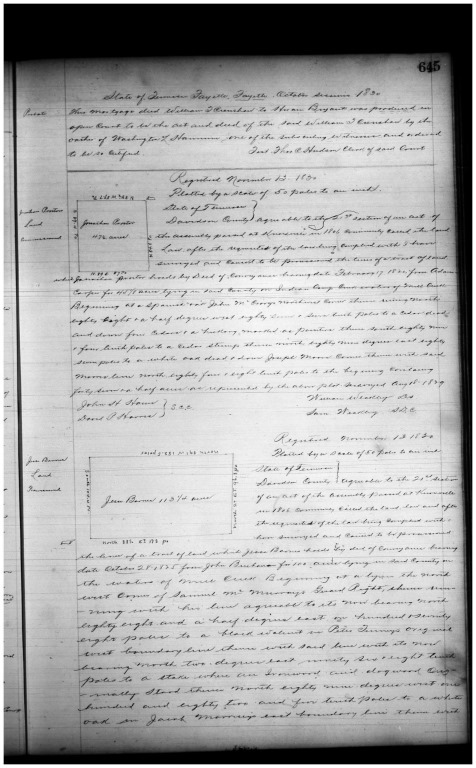 So, Jonathon Proctor, in 1830, registered a deed that he had in his possession that had been dated February 1820 from Adam Carper, under this land act for 45 1/2 acres of land on Mill Creek in Davidson County, TN. Why Jonathon waited nearly 10 years to register his deed from Adam Carper is unknown. But it is obvious here that he is using the Land Law Act of 1806 to protect his property and to make sure that it was recorded in the Davidson County, TN deed books. Its possible as the 6th district of Davidson County grew, Jonathon just wanted to insure where his boundary lines were or perhaps he wanted to put up a fence. Whatever his reasoning, by doing this Jonathon protected his land and established its boundaries and ensure that he would be able to see it with a clear title at some point in the future. Jonathon sold this same land to Alvah Gilman in 1843. At least 20 days before the surveyor came out, Jonathon would have had to have made it public knowledge that he intended to procession his land. Because early deeds used fallen trees, creeks, rivers, etc as boundary lines, lines could often change. In early Virginia, land owners were to procession their land every four years. Its probable that the land marks used in the Carper deed had moved or disappeared and Jonathon was wanting to reestablish his property lines by having the plot resurveyed. He would have paid the cost of doing this and then the new Procession Deed could be filed in the deed books, assuming none of his neighbors complained. Apparently none, did as the deed was recorded in Davidson County, TN deed book S, Page 645. On February 25, 1829, Samuel Cutchens, John’s Father-in-law purchased this piece of property from John A. Proctor for $150. Apparently John had Processioned it so that he could legally sell it to his father-in-law. It was mortgaged to Samuel Cutchens on the terms that if John or his heirs could pay back the $150 plus interest, the land would return to John A. Proctor. At some point John gets the land again, because he sells it again in 1853.